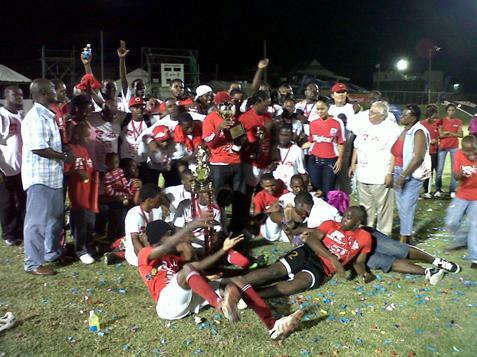 Rams Village Superstars have been crowned the 2010/2011 Digicel Premier League Champions. Village came into the final four competition in fourth place after struggling during the season. They made a comeback during the second round of the season and had been on an upward trend ever since. They won the first ever Easter cup at the end of the second round and then went on to win the FA Cup a few weeks later. Going into the Final Four competition Rams Village Superstars were at the top of their game and came up against the top seed S L Horsfords St Pauls. St Pauls had been on the top of the table for all three rounds of competition and would not be an easy task for the Village. However, in the first matchup both teams came out with a draw. They would then meet again in the Finals, which turned out to be an exhilarating, controversial and fantastic end to a tremendous season. The finals began on Wednesday 15th June and both teams were geared up and ready to take on the challenge and prove their dominance. The Stage was set top seed S L Horsfords St Pauls versus fourth seed Rams Village Superstars. St Pauls were once again poised to take back their championship title which they lost to Delphic Newtown the previous year. Rams Village Superstars who have been in the wilderness of the playoffs and finals for the past few years were determined to make sure that this one would be their Championship. In the first game Rams Village Superstars would stun the St Pauls team and fans and secure their first game in the finals, with a 2-1 win. St Pauls would have to go back to their drawing board to come up with a plan to ensure that they win the second match and that they did. The second game St Pauls would come back and deny Village a two game win by defeating Village2-1. This win set the stage for a third and final game of the season. The final game started with both teams seemingly hurried to score their first goal. Nerves were obvious as both teams were playing fast and often losing the ball. At the end of the first half both teams returned to the locker rooms scoreless. The second half began with the teams more relaxed and playing better football. In about the 65th minute of the game Rams Village Superstars would bring the massive crowd on their feet with a goal from the boot of Lawrence Ajah Jeffers, to put Village on the scoreboard with a goal. Rams would defend their first goal and would also score two more unanswered goals by Alister Warner and Jevon Francis to defeat S L Horsfords St Pauls and win the championship 3-0. The St Kitts Nevis Football Association 2010/11 Season was a success in many ways. The Association introduced three rounds of football this year and also introduced small tournaments such as the Sugar Mas Cup and Easter Cup. These innovations have brought excitement to each round of football as all teams in the Premier Division played competitively to be in the top four at the end of each round. The fans had also been coming back to football in a very large way after the association was faced with having to move the games to various venues, while Warner Park grounds were being brought back to playing conditions. The Division 1 was also a success with Cayon FC winning that playoff and being promoted to the Premier Division. Cayon had a stellar season winning all their games in the division including all their games in the playoffs and finals. The St Kitts Nevis Football Association would like to formally congratulate Rams Village Superstars and Cayon FC for winning their division championship. These teams have played and brought excitement to football in a very unique and memorable way. The Association is very proud of both teams and is looking forward to next season’s competition which is guaranteed to be as exciting and even better competition. The St Kitts Nevis Football Association would like to thank its sponsor Digicel and the sponsor for the Final Four ICT 4 EDC for their support. The SKNFA is looking forward to their continued support for the upcoming season. The SKNFA would also like to thank the hard working staff for a job well done for the entire season.